Rather than think of a whole chicken cooked in the slow cooker as a poor imitation of an oven-roasted chicken, see it as a different dish. You can very successfully cook a whole chicken in the slow cooker and it really is a delicious, versatile dish. But, that is not to say that it is like a ‘traditional’ roasted chicken, most notably because it does not get a crispy skin. Now, as we all know, the crispy skin is both the most delicious and the most unhealthy part of the roast chicken, so perhaps by not having it you are saving yourself a pleasure and a pain. No crispy skin however, can mean a rather unappealing flabby skin instead, so forewarned is forearmed! 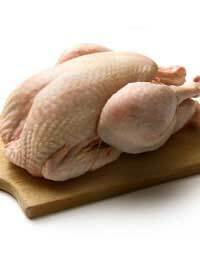 A slow cooked chicken does not have the burnished, golden skin we all love, but skin that looks about the same as when it went in – pink, pale and rather sad. To counteract this, you can fry or grill the whole bird all over before you put it into the slow cooker, which quickly crisps up the skin and makes the whole thing look better. This is rather a burden – the ergonomics of spearing a chicken and rolling it around a frying pan is unwieldy and grilling the bird is tricky as well as frustratingly likely to set the fire alarm off. This leaves you with the option of skinning the little fellow, assuming you do not want to simply leave the skin on and let it flop there, although it can easily be removed after cooking, which is perhaps easiest. Skinning the chicken before you put it in the slow cooker is a really healthy way to cook it as all the fat you’d get from the skin is removed. A good way to stop it looking quite so pale is to put plenty of herbs and seasoning over the top, too. So whether you've chosen to brown or skin the bird, start by chopping a large onion into big chunks and use them as a trivet on the base of your slow cooker. This simply means that the chicken is not directly touching the base of the slow cooker, which can scorch it a little when cooked this way. You can also include some other vegetables at this point, such as sliced carrots and potato, so it’s a true one pot dish. If you like, sliced fennel goes really well too or you can add a chopped clove or two of garlic and use tarragon as the herb. Slosh in a glass of white wine, Noilly Prat or vermouth on the vegetables (you can heat this in the microwave first to speed things up if you like) and season generously. Then gently place your chicken on top of the vegetables. It’s fine if the bird is touching the liquid, but it does not need to be covered with liquid as you need with stews. It’s best if you slice the potatoes finely though so they lie flat on the base of the slow cooker as it will help them cook more evenly. At this point, you can add in some flavourings, or just leave it plain. A couple of sliced fresh green chillies give a bit of a kick, or a handful of fresh herbs. A chopped lemon or orange also works really well, especially if you add a few good olives too. Put the lid on and whack the slow cooker on high for the first hour, then reduce it to medium for 6-7 hours or low for 8-10 hours. When the dish is cooked, you need to be really careful when you remove the chicken as it will practically fall apart – use two serving spoons to take it out. You can serve the vegetables alongside the chicken and either have the juices as a light broth or gravy, or add a mixture of butter and flour to thicken for a few minutes while you cut the chicken. Serve with plenty of mash potatoes and garlicky green beans.